For all those who made this work possible. Since the first meeting, the Grandmothers have gathered in the homelands of the different Grandmothers to pray together and hold council, to listen to the people of the land and those who come, and to respond to the requests from the greater world. This summer it was Grandmother Margaret’s turn, drawing the council and the eyes of the world to her community, the Northern Cheyenne Reservation in Montana. Grandmother Margaret reached out to Gigi Coyle, visionary of Beyond Boundaries, asking for support. Gigi first helped initiate and host a spacebridge council with the Grandmothers at Bioneers in 2007, and has continued to spread their message of hope. The Beyond Boundaries (BB) vision of service, co-creative learning, bearing witness to and supporting positive work in the world is another iteration of the same prayer. More than two years after the BB pilgrimage a growing, intergenerational group continues to listen and respond to the larger global community working towards a regenerative future. Gigi felt the call for support from Grandmother Margaret was an opportunity for a BB response. Although Gigi was unable to attend due to a scheduling conflict she felt that other members of the BB team could support Grandmother Margaret. She also assisted in the raising of funds for the construction of tipis for the gathering. 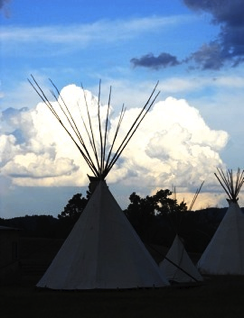 BB timing and funding made it possible for one pilgrim, yours truly, to travel to Montana in service of the gathering. I spent three weeks camping at Grandmother Margaret’s, working and witnessing a great gathering. I went to Grandmother Margaret’s in early July, to offer support in anyway I could. A Beyond Boundarian, I came to serve and to learn through the work. There was a lot of work to do! Arriving just two and a half weeks before the gathering began, I quickly jumped in, helping to prepare the house for visitors, feed the volunteers, move tipi poles – anything that was needed. Within a few days it became clear that organizational help was needed, and Grandmother Margaret asked me to be the liaison between her local core team of support from the reservation, the volunteers gathering around her home, and the Center for Sacred Studies (a California non-profit instrumental in initiating the Council and coordinating subsequent events). As a witness and a participant, I saw first hand the bridge-building work of this gathering. The world came to Lame Deer Montana, and Lame Deer did not know what was coming. It was a dance of prayer and manifestation, trust and coordination, communication and flexibility, and constant change. I became the list keeper, the go-to-gal (or as one person introduced me: ‘mobile mission control center’). I worked closely with Grandmother Margaret’s assistant, helping to track the many details and keep communication smooth. I became the bridge Grandmother asked me to become. I was able to be a peacemaker and a witness. I learned how to listen, to slow down and put down my to-do list long enough to remember that listening to an elder’s story is part of the prayer and healing. I bring my heart of love and peace and that mission of prayer and alliance. I come here with much respect for the ancestors of this land. ~Maria Alice Campos-Freire, from Brazil, during the opening of the Council. The gathering itself was powerful. With the theme ‘Gratitude Brings Freedom’ and two keynote speakers on the issue of historical trauma, there was a focus and opportunity for the story of the place and the Cheyenne people to come into the center. One of the most touching parts for me was when the Cheyenne did show up, on mic, during the second day. They said thank you. They said there may be mixed response from the community but we see the power of your prayer and the importance of the work you are doing for the world. Thank you for doing this work here. "I'm here to apologize formally to the Northern Cheyenne." Reconciliation, apology and forgiveness rippled through the field, shaking people in their prayers, bringing forth tears, stories of pain and heartfelt apologies. Eduardo Duran, keynote speaker, said "In any human interaction, if there's been a violation, in order to heal the complete system, the perpetrator and the victim, ideally there should be an apology." He spoke of the power of intent, the power of giving something back, the power of returning to wounded places. These acts can transform the energy of trauma. The field of healing was palpable. Grandmothers, organizers, volunteers and participants… together we created a field of reconciliation and prayer. As is the nature of council, when gathered around a central prayer, something greater can come through. This is a hopeful picture, a picture of forgiveness and healing. Deeply moved and inspired by the Council, the prayer, the Gathering, the land and the people, I listened for possible future collaborations. Part of the BB vision of cross-cultural collaborative work is ‘The Global Village Council House Initiative’. This project seeks to generate an interconnected global community of peacemakers through the co-creation of sacred shelters, using natural earth-bag technology and group circle processes. Bridging race, culture, age, gender and nationality, this vision is part of a greater movement for diverse, interconnected regenerative world culture. And from this listening this is what emerged…. Part of Grandmother Margaret’s vision for her community’s cultural reawakening is bringing elders and youth together. She has formed Council of Cheyenne Elders, calling on local Grandmothers and Grandfathers to participate in a spiritual education based on the wisdom of their ancestors and ways of their people. During the preparation for the gathering a beautiful arbor was built by volunteers and local youth, and blessed by the Grandmothers. This arbor will serve as the center for the future T’sistsistas’s Sacred School, which was inaugurated during the gathering. Grandmother Margaret’s vision includes permanent natural buildings and cross-cultural collaboration, and when she heard of BB’s earth-bag council huts, she became excited. We are in the process of creating a proposal for such a project for 2013. Our estimated budget for this project was $1,000. The actual direct costs were $454 for travel and $136 for food and contributions to Grandmother Margaret’s volunteer household. With the 6% administration fee, the total cost was $626, remaining funds will go towards the upcoming BB council hut project with International Peace Initiatives in Kenya. In addition, Center for Sacred Studies gave Siri $500 for her work, which she will pay forward towards future BB projects. Thank you again to all those that gifted us to make this journey possible. Thank you for this opportunity. Thank you to the Cheyenne who welcomed me to their land, to the land itself for revealing such beauty, to the ancestors whose stories touched my heart. Thank you to Grandmother Margaret, for seeing me and using me, and for the humor and vision. Thank you to Center for Sacred Studies, for their example of prayer in action and the power of vision manifest. Thank you to those of you reading this, for your part in this prayer. Thank you to all those who support Beyond Boundaries, for the words, the listening, the collaboration, and the financial contributions that make this work possible. Thank you for the possibility to be well used and thank you for collaborative learning - for a regenerative way of living on this planet. I am blessed in connection with this web of light.